Our days are getting busier. There are many things we need to accomplish in the next few weeks. Pre-conditioning calves is currently at the top of the list. We worked this bunch of cows and calves at our neighbor’s corral. We are blessed with wonderful neighbors, have I mentioned that? Our neighbors realized that this group of pairs was closer to their corral than ours and they offered to let us use their facilities. Just like that. 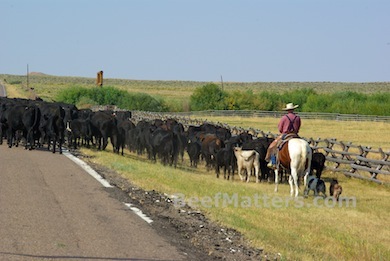 When we pre-condition, we gather the cows and calves and bring them to the corral. After sorting the calves into one pen and the cows into another, we run the calves through the working chute and give each calf a couple of vaccinations. Then we turn them back in with their mothers and trail them to a new field. We sometimes refer to pre-conditioning as “practice weaning” because the calves get an idea of what will happen on the day they are weaned. The main reason we choose to pre-condition our calves is that the vaccines are more effective if the calf is in a low-stress situation. 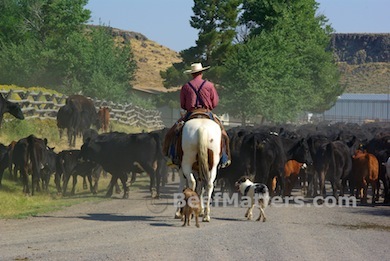 Turning the calves back in with the mama cows is the best way to reduce stress in the calf. The resident two-year old and I tagged along with the cowboys for a few hours. 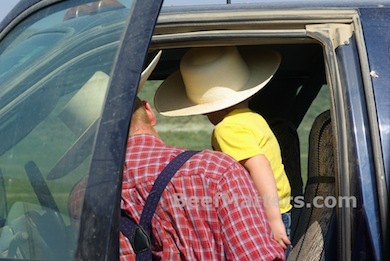 Our last job, before he and I went home for nap time, was to haul cowboys to the various pick-ups and stock trailers that were left at the starting point of the ride.